Beautiful Victorian Lake land Stone house, stunning location standing alone in meadows against a backdrop of lake land mountains. Fully modernized whilst retaining many period features the house sleeps 10 and is ideal for two families, large family gatherings or groups of walkers or friends. 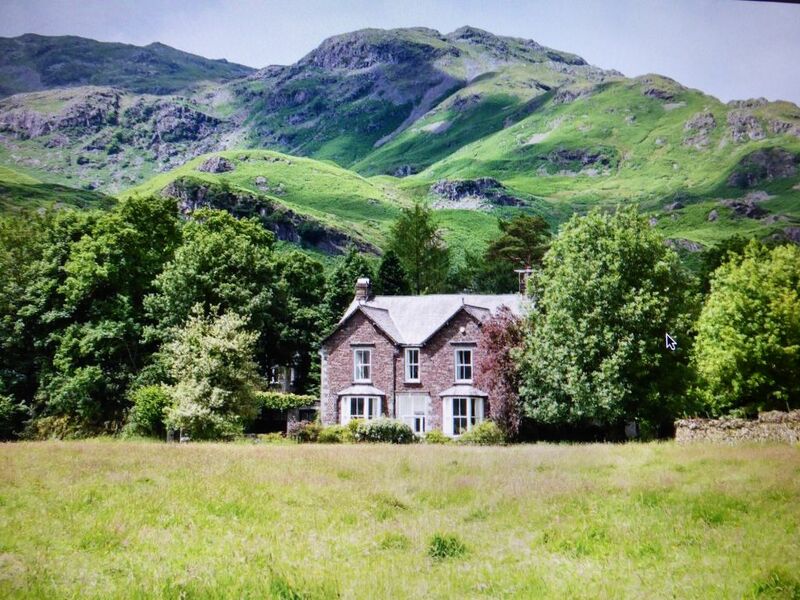 Situated in Grasmere ,one of the Lake District's most popular villages, the house is centrally situated for taking on the craggy peaks of Scafell, Hellvellyn, Skiddaw or many of the other lake land peaks. For those wanting a more relaxing holiday there are plenty of gentle walks around the lake and places of interest to visit nearby. The property sleeps 10 plus cot and has five bedrooms - three large doubles, one room with three single beds and one single room. There are two bathrooms - one with a shower and one with a bath and shower. On the ground floor there is a large elegantly furnished sitting room with a real coal fire and beautiful large windows giving stunning views. The room has a TV and full sky TV service. The recently refurbished huge kitchen/diner is fully equipped with ovens, dishwasher, microwave and fridge freezer. There is a large island with bar stools and a wall mounted TV. The diner has a large circular table with 10 chairs, a log burner and a couple of occasional chairs too. There are stunning views onto the meadow. There is also a boot room, ideal for muddy boots and coats. A washing machine and separate tumble drier are situated very near this room. The garden is large, enclosed and private with many fruit bushes and beautiful plants. Downstairs showeroom with walk in shower, toilet and wash basin. Upstairs bathroom with separate shower, roll top bath, toilet and wash basin. This is a really special place. We were looking for somewhere that could comfortably accommodate a large family gathering (12 of us ranging from age 2 to 70!) that was well away from the crowds yet not so remote that you can't easily access stuff - Little Parrock fitted the bill well. It's a short jaunt up to Helms Crag (don't miss it as the views are fab) and local walks in the area, and a mere 15 minute stroll into Grasmere itself (or 5 minutes on bikes - we brought our own which really allowed us to explore the area well). All of the rooms are spacious as well as the open plan dining and kitchen. Living room was comfy and having a proper fire place really added to the ambience on cool evenings. Having the rear porch was great too as it meant we didn't have to traipse in muddy boots at the end of the walks. Unlike some large houses that don't have enough seating in the dining area, this place has ample which allowed our large family to congregate. The kitchen itself is very well kitted out to a high spec which was great as we enjoyed cooking and eating in most evenings. Being so remote meant that on a clear evening we had lovely views of the stars too. - the sheep - make sure you shut the gates as otherwise they get into rear lawn area and leave lots of little messages! - I think we were early in the season so the lawn area hadn't been tidied up more so it wasn't appealing for the kids: bits of overgrowth and rubble in some corners. We would be more than happy to use this place again. We (me, my two brothers and our children) stayed here as we were going to a wedding in Grasmere. We absolutely loved the house and its location. We are hoping to go back soon. Thanks so much for your review and we're so glad you enjoyed staying at Little Parrock. We look forward to seeing you again in the future. Grasmere is probably one of the Lake District's most popular villages thanks to William Wordsworth who lived here at the turn of the 19th Century. The village itself has plenty of shops to provide for your everyday need, and it is well known for its gingerbread and fine food. Around Grasmere lake there are plenty of gentle walks for those preferring lower ground, or why not take a rowing boat out to visit the island. For a greater challenge, Little Parrock is centrally situated for taking on the craggy peaks of Scafell, Helvellyn, Skiddaw and the Langdale Pikes. Guests to arrive after 4pm and leave by 10 am to allow time for cleaning. £100 damage deposit taken by separate cheque.